Nine inches of snow fell in Billerica Thursday into Friday. 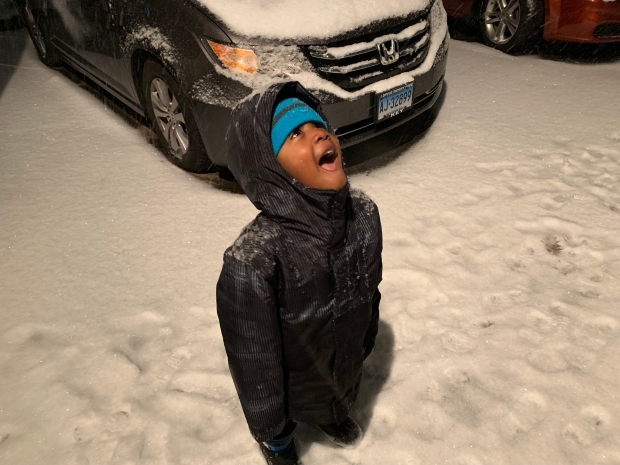 The first snow of the season blanketed New England on Thursday, resulting in car crashes, power outages and school and flight delays. State police said a stretch of the Massachusetts Turnpike east was closed Friday morning after several tractor-trailer crashes. Another crash involving a snow plow led to delays on Interstate 495, and an accident on Interstate 93 in Wilmington also caused issues. Traffic delays were reported across the state throughout the morning commute. A single-vehicle crash was reported around 11 p.m. Thursday on Route 151, according to Falmouth police. Officials said the crash was weather-related and said the driver is OK. Speed restrictions were in place Friday morning on the western portion of the Mass Pike and on New Hampshire highways. The MBTA reported some delays as well due to storm-related issues. The Acton line experienced delays after a train hit a snowbank, and the Kingston line saw delays due to a tree down on the tracks. Some areas of Massachusetts received more than nine inches of snow, and it was heavy and wet enough to cause some power outages. Topsfield, Carlisle and Billerica northwest of Boston were among the towns that topped the nine inch mark. The storm started as light, fluffy snow and continued Friday as cold rain. As of 5:47 a.m., the Massachusetts Emergency Management Agency said more than 5,300 customers in the state were without electricity, most of them south of Boston. 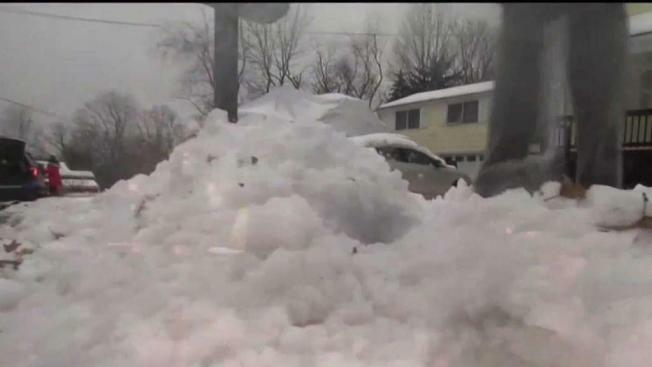 Wires were downed in Hanson, Massachusetts, causing a fire in the snow. Firefighters warned residents to refrain from approaching downed wires and to call 911 immediately. Hundreds of schools across New England issued delays or closures due to the weather. Delays were also reported at Logan International Airport, with some flights even canceled due to the weather. "My daughter is coming home for Thanksgiving Day from the University of Miami, and her flight landed at 12:20 and it's now 2:10 and they've been sitting out on the Tarmac for almost two hours," said Susan Barnat as she waited at Logan early Friday morning.